FileZilla and Notepad++ both are well-known mates of a Web developer. Inherently, FileZilla open text/syntax related files into Notepad. Lack of functionality in Notepad makes us set Notepad++ as the default editor for FileZilla FTP Client. Notepad++ also comes up with built-in FTP explorer. However it not suitable for advanced FTP operation. 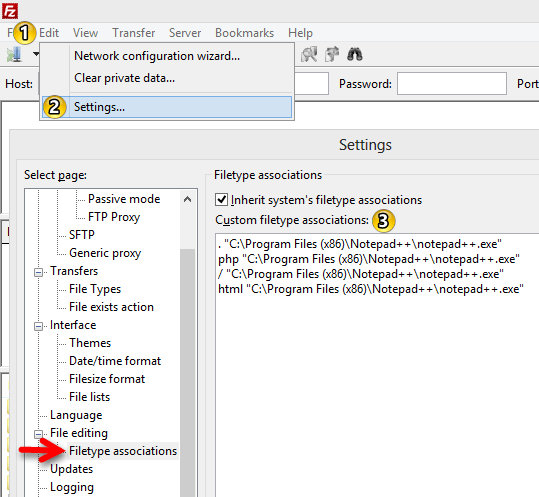 Unlike, FileZilla has more features to play with FTP and web. Open FileZilla > Edit Menu > Settings.. Please verify the path of Notepad++ on your PC and correct it in number 3 explanation. Moreover, you can set multiple editors based on file types. You have to give a file extension followed by the path of the particular editor.